Indian High Commissioner in Dhaka Harsh Vardhan Shringla on Saturday said Bangladesh and India are now in negotiations to sign a memorandum of understanding (MoU) soon for cooperation in the field of medicinal plants. “Once signed, this MoU could open up new vistas for joint collaboration, including transfer of technology in medicinal plant cultivation, exchange of monographs on medicinal plants and the development of digital databases on medicinal plants,” he said. 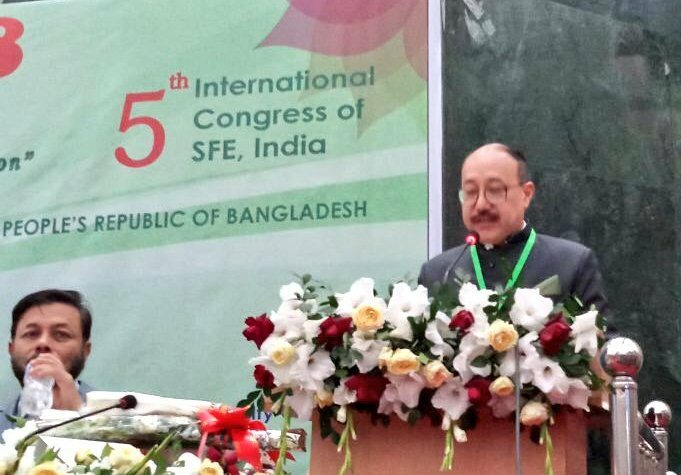 The High Commissioner was addressing the inaugural session of the 18th International Congress of International Society for Ethnopharmacology and 5th International Congress of Society for Ethnopharmacology, India (ISE-SFE 2018) with the theme ‘Ethnopharmacology & Drug Development: Innovation meets Tradition’. Science and Technology Architect Minister Yeafesh Osman addressed the programme as the chief guest, reports UNB. Vice Chancellor of Dhaka University Prof Dr Md Akhtaruzaman, former Governor of Government of Chhattisgarh, Shekhar Dutt, President of International Society of Ethnopharmacology Prof Guillermo Schemeda Hirschman, Secretary of Society for Ethnopharmacology India Prof Pulok K Mukherjee, Chairman of India Bangladesh Friendship Society Dr AK Azad Chowdhury and Organising Secretary ISE-SFEC 2018 Prof Dr Sitesh Bachar also spoke on the occasion. The High Commissioner said India and Bangladesh are traditional repositories of ancient systems of healing, including Ayurveda, Unani and other such systems which have been widely practiced by our people since times immemorial. He said the signing of the MoU on cooperation in traditional system of medicine and homeopathy between India and Bangladesh in 2014 has provided an impetus for joint collaboration in several aspects of traditional medicines. The areas are joint research, mutual recognition of pharmacopeias and formularies, exchange of experts and mutual recognition of traditional preparations, he said. High Commissioner Shringla said the sharing of knowledge and experience between the participants will enrich our cumulative knowledge in this field which could be used for the betterment of the people of the two countries. “Globalising accumulated local knowledge in the field of traditional medicines and the promotion of scientific studies on naturally derived products would go a long way in establishing the future of ancient systems of medicine,” he said.